Maple Kitchen Tables , Prep Carts , Butcher Blocks and Swivel Stools are on sale! These maple kitchen tables, prep carts and butcher blocks are really sweet. 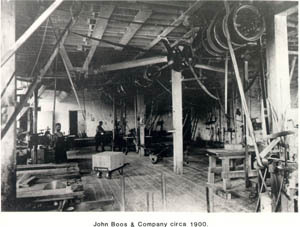 John Boos has been making high quality products since 1887! Made in the USA! The Cucina Americana line combines function with style, select solid maple tops and heavy duty stainless steel. With proper care these tables can last for many generations! These carts and tables are used by many famous Chefs across the USA! Top 10 reasons you should buy your John Boos Products from Chef Depot! Find a lower price on any John Boos Product and we will beat it! Free Shipping! History, Made in the USAJohn Boos & Co. is the oldest industry in Effingham, Illinois. It has been in business continuously since 1887. Conrad Boos Sr. founded the business in 1887 and named it for his son, John. For many years he worked out of the blacksmith shop, which was located at what is now 406 West Jefferson Street in Effingham, Illinois. The wood for his blocks was cut in wooded areas surrounding Effingham and was mostly sycamore lumber. The lumber was processed in his sawmill and sent to his shop for finishing. The plant operated from a blacksmith shop until 1892 and then it moved across town, and began producing the blocks as we know them now. The blacksmith used a sycamore tree placed on three legs to straighten horseshoes. The wooden block absorbed the shock of the blacksmiths hammer. When the butcher saw the block where the anvil was resting, he realized he could use one in his meat market. So John Boos made him one and the rest is history. 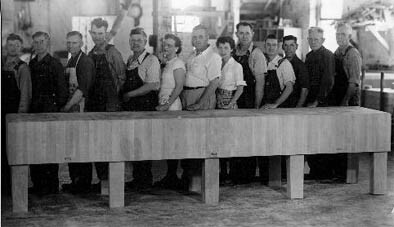 In the early days the butcher blocks were built for commercial meat markets. At the turn of the century meat purchased at the local market was not refrigerated or frozen, but hung. In 1892 the Boos family sold interest in the company to the Gravenhorst family. (There is currently a fifth generation Gravenhorst working for the company. T.S. Gravenhorst, III was named President in 1978 and held that office until retirement in 2002.) In 1895 the building burned and was rebuilt; however, in1899 it was decided that more space was needed, and it was then that they moved to the present site of 315 South First Street. The building was purchased from the old Effingham furniture manufacturing company. In 1920, extra buildings and kiln capacity were added. By the 1940s, butcher blocks were found in every restaurant, food store and butcher shop in America. Then came World War II, which was instrumental in changing the manufacturing philosophy of the management at John Boos and also the course of the business. Up until the war, the company made the old-fashioned butcher block. The war brought about a need for other items, however, including foodservice tables, work tables and tabletops. The Granite City (Ill.) Ordinance Depot was in charge of buying these items for the Army, Navy and Marines for the mess halls and kitchens. These government contracts took up approximately 90 percent of Boos business, and the company wasn't allowed to solicit any other business until it met the needs of the military. However, this led to the realization that John Boos & Co. could build other items besides butcher blocks. In 1955, the company expanded by adding a dry kiln, increasing its office space and adding more manufacturing space. The shipping docks were enlarged, warehousing space added and new products added. In addition to the standard old-style butcher blocks, butcher block tops, which are laminated strips of northern hard rock maple or Appalachian red oak, were in great demand, not only in the foodservice industry, but also in the home. The company continued to expand during the late 1960s and early 1970s with the growth of its metal fabricated table market. Metal tables had replaced the butcher block as a necessary product in the majority of foodservice/supermarket establishments. Tables with poly or synthetic tops, stainless steel tops and maple tops were being manufactured. And even though the government was tough on wood products through the 1970s and 1980s, the company continued to grow with its new line of BDL store fixtures, park benches and other butcher block furniture items. The company currently occupies approximately 150,000 sq.ft. of total production capacity in Effingham, IL and approximately 65,000 sq.ft. of manufacturing capacity in Philipsburg, PA and Suring, WI, which produce wooden school furniture. The company has four dry kilns that will dry up to 210,000 board feet of lumber on a continual basis. There are 140 employees in the Effingham facility. Most of the hardwoods used for manufacturing is shipped from Great Lakes states via truck, while our second largest commodity, stainless steel, comes from steel warehouses and distribution centers in Chicago, Indianapolis, and St.Louis. The company currently is cutting up about five million feet of maple and oak each year. The wood and metal products are listed with the National Sanitation Foundation, the leader in sanitation agencies for approving equipment to be installed in foodservice and supermarket operations. The products must have approval of various sanitation agencies in order to be accepted by the industry. The stainless steel product group, which continues to expand, now includes stainless steel sinks, shelves, carts, etc. One of the outgrowths of our stainless steel plant and our wood plant is the new Cucina series of foodservice carts made from northern hard rock maple and foodservice grade stainless steel. The product has received instant acceptance from professional, as well as domestic chefs throughout North America. Sales are made through major gourmet catalog companies, as well as foodservice equipment dealers. Mixing the two materials provides John Boos & Co. with a competitive edge as the manufacturing begins and ends in Effingham, IL. John Boos & Co. Cucina products, butcher blocks and cutting boards are being used by celebrity chefs throughout the United States. Celebrity chefs currently using John Boos products are Charlie Trotter, Ming Tsai, Paul Kahan, Susan Spicer at Bayona Restaurant in New Orleans, and Mary Sue Milliken and Susan Feninger at Border Grill in Santa Monica, California. In addition, the countrys premier food channel, THE FOOD NETWORK features chefs, such as Mario Batali and Emeril Lagasse, who prepare meals every day on John Boos cutting boards. In most cases Boos cutting boards are used on the daily and weekly television programs sponsored for the chefs. In 1994 we were awarded the Gold Medal for Excellence in Foodservice Equipment by the Chefs of America. This ceremony was conducted at Carnegie Hall in New York City, and we were one of only 22 companies receiving awards. Our FSC certified lumber is derived only from forests that are properly managed according to the highest social, environmental and economic standards. The company sells its products under the registered trade names, "BOOS BLOCKS", "PRO-CHEF", "CUCINA AMERICANA", "PRO-BOWL" and "STALLION" work tables. Buy some American History and Update your Kitchen Today! Click on the pictures and links below! Click the green arrow on the right for more Maple Tables & Kitchen Carts! We have the Low Prices! If you do not see it, call us! Copyright 1999 - 2014 Chef Depot Inc.